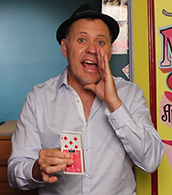 So many card tricks involve some sort of sleight of hand. The get down trick does not. It contains a special secret. The secret will involve you wrecking one of your cards by cutting it. If you are using a regular deck, there should be an extra joker or an advertising card that people usually throw away when they first open the pack. I keep these cards so I can use them in magic tricks such as this. 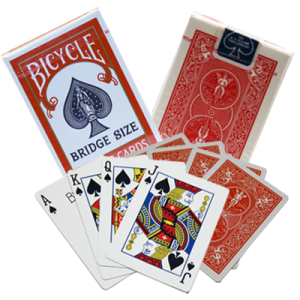 It’s recommended that you buy a second deck of cards that you can use to practice your fans and shuffles that result in you bending your cards. You can use cards from this deck as you don’t need full deck to practice with. This is a great way to maintain your perfect deck. Use the provided download to get your own copy of the card that was used in the tutorial. The cut will be explained on the download and remember that it doesn’t have to be totally accurate. You might have to experiment and find a variation that will work for you if needed. If you do find a good variation, be sure to contact me and I will post them on this page and credit you. 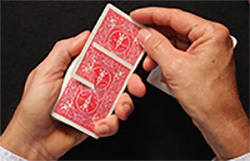 The idea for this trick originated in “Self Working Close Up Magic – 56 Fool Proof Tricks” by Karl Fulves. The effect is namedthe “Excelsior Card Rise” and it was originally made by Stanley Palm and Rick Johnson. I used this premise and created my own story line that would work with the get down trick. I was in the army years ago and they would make us march around the parade ground multiple times. This was used to make us react instantly to orders in combat; so if someone yelled get down, you make sure you did. If you remained standing, you were most likely to get taken out by the enemy forces. Did you enjoy this “Get Down” Trick? To learn more simple magic tricks Click here! Only needs a little ‘prep’ and a good story. What is the purpose of cutting the box of cards, Julian? Was that simply to demonstrate what happened inside the box?